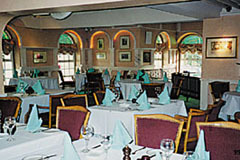 The Casa Romana restaurant offers the finest, freshly prepared Italian cuisine served in relaxed, elegant surroundings. For affordable luxury, whether business or pleasure, we can accommodate your every requirement. Three course set lunch Mon-Fri £14.95 and three course Sunday lunch £16.95 with a choice of starters from the buffet. Open for lunch Mon-Fri & Sunday and for dinner Mon-Sat 7-10.45pm, Sun 7-10pm. All major credit cards accepted. 12.5% service charge. The finest, freshly prepared Italian cuisine.